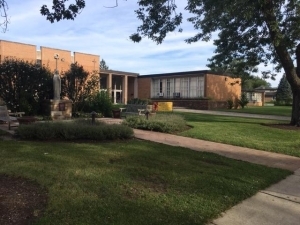 If you remember First Fridays, the May Crowning, beanies, colossal class sizes, venial sins, and a cast of mentors/characters such as Mrs. Peterson, Sister Mary Agnese, Sister Mary Cuthbert, Father Coogan, Mrs. Oakley (and too many others to mention) – and even if you don’t – mark your calendar for Saturday, October 19, 2019 for the St. Irenaeus School All Years Reunion. Whether you attended SIS for eight years or just one, come join your classmates at St. Irenaeus Parish Hall (what used to be our big box church) for hors d'oeuvres, drinks, 50s and 60s music and lots of fun memories. This might be your last chance to clear – or embellish! – the Permanent Record that’s been following you around since you giggled during Communion practice in second grade. Don't miss it! When: Saturday, October 19, 2019 at 6:15pm. A Mass will be held at 5:00pm in the Church for all St. Irenaeus Alumni and guests. Where: St Irenaeus (Old School Building), 207 S. Orchard Drive, in Park Forest, Illinois 60466. Tickets: Tickets are $50 per person and can be purchased on the Reunion MyEvent page or by mail (click here to download mail in form). Purchase includes all the hors d'oeuvres you can eat, non-alcholic beverages and tickets for 3 alcoholic beverages (wine, beer, mixed drinks). A cash bar will be available for anything above and beyond that. Cancellation Policy: If you are unable to attend and let us know by email or phone by October 1, 2019 and your ticket price will be refunded. Most of the school records have been lost, so if you have any pictures or memorabilia, please send them to Lynne Hostetter, c/o St. Irenaeus Church, 78 Cherry St., Park Forest, IL 60466. You can also scan and email pictures to st.i.reunion2019@gmail.com. Just let us know if you want anything returned.